Heat oven to 350°F. Place cookies in blender. Cover; blend on high speed until finely crushed. In small bowl, mix cookie crumbs and butter. Spread on ungreased cookie sheet. Bake about 5 minutes or until golden brown. 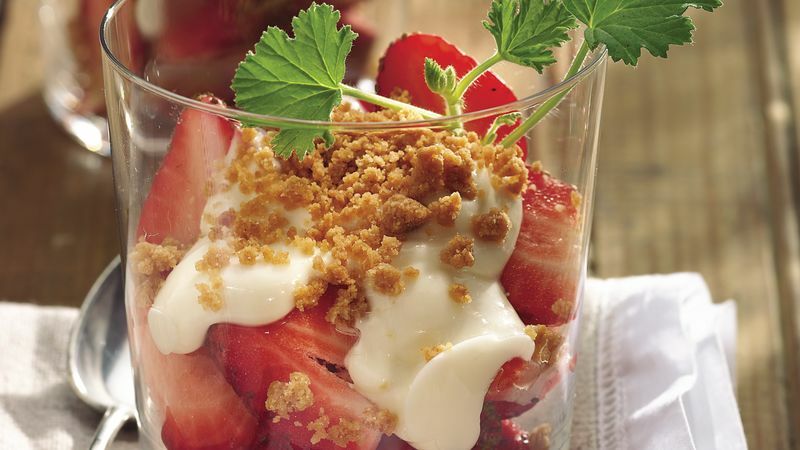 Divide strawberries among 4 large wine glasses or individual dessert dishes. Top each with about 1/4 cup cream cheese mixture; sprinkle each with 2 tablespoons crumbs. You can use raspberries or a combination of your favorite berries instead of just strawberries in this elegant dessert. Keep strawberries at their freshest by waiting to wash them gently until just before you hull them. As strawberries absorb water, they begin to lose flavor.